“Oh death, where is thy sting?” Halloween on the Duck Dynasty set. Hilarity Ensues: As with many of the situations on Duck Dynasty, this episode’s conflict and comedy comes from the boys’ relationships with their wives. When Korie suggests that they turn the warehouse into a haunted house for the local kids, this leaves Willie, Jase, and Jep arguing over how a “real man” should approach Halloween. Willie avoids Korie’s idea of a “couple’s costume” (Cleopatra and Marc Antony) which would be the epitome of lost manhood, but he still dresses like Freddie Kruger in order to scare the kids…and Si. Is this for Real? : Who cares when someone came up with the stroke of genius of having Si do his rendition of the “Thriller” dance? Whatever else Si is, he’s a brilliant physical comedian. Watching his ancient scarecrow-thin body go through Michael Jackson contortions was one of the highlights of the season. One of the things I also love is when the kids show up for the haunted house, they’re in these Hollywood costume-designer outfits. One kid is dressed as a perfectly proportioned Rubick’s Cube, which is a pop culture reference from about 20 years before he was born. Other kids are in impeccable bumble-bee outfits and zombie costumes. It reminds me of Halloween episodes on sit-coms of my youth like The Cosby Show, where everyone would be in perfectly tailored costumes for the Halloween Party. There was none of the thrown-together thrift store stuff real kids wear. Perfectly-costumed kids, a staple of any sit-com Halloween episode. The only time I’ve ever seen truly professional-quality costumes at Halloween was at an art students’ dance. From expertly applied makeup and hair concoctions to actual vacuum-molded plastic Star Wars storm trooper outfits, art students know how to do up Halloween. 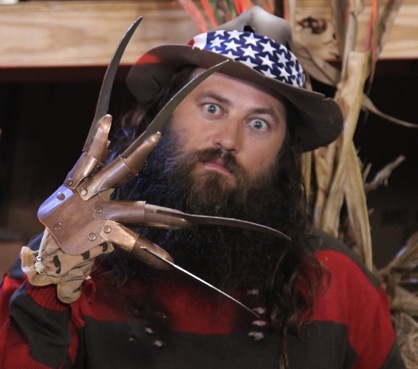 The Christian Angle: I’m sure the Duck Dynasty boys won’t be getting much love on the evangelical Christian message boards for celebrating Halloween. The holiday has been labeled a Satanic celebration in many fundamentalist Protestant circles. He then shows his grandkids how to “carve” a jack-o-lantern by shooting it with a shotgun. When I was a kid, there was some of this superstition around Halloween in my home. Nobody banned me from begging for candy the same as all the other kids–we weren’t Jehovah’s Witnesses. Pumpkins and costumes were all well and good, and black cats were fine because we had this sweetheart of a cat named Noir. But even into my teen years, I had a distinct discomfort with the ghost and goblin side of the holiday. I think a lot of the Protestant problem with Halloween started as anti-Catholic animus, and the usual Protestant misinterpretation that to honor saints is to somehow worship the dead. I don’t think Halloween is any more a pagan holiday than Christmas or Easter—which is to say, very pagan, but dressed up in Christian theology. Maybe we Protestants should stop worrying our kids with stuff that’s pretty harmless, like dressing up like ghosts and goblins, and worry about something that’s an actual risk at Halloween— like the specter of childhood obesity. Si takes a tea break in his beaver costume.